The vicious murderer who shot up the movie theater in Aurora, Colorado last week was wearing, according to some reports, "full body armor. "* Proponents of concealed-carry permits maintain that if the theater had not been a "gun-free" zone, the shooter could have been taken out in short order by an armed populace. Given that the man was wearing body armor, is this a reasonable conjecture? If someone — an off-duty policeman carrying a standard-issue .40 caliber Glock 22, say — had been in the audience and been able to get off three shots at the shooter's center mass, would the impact, while not penetrating the chest cavity, at least have disabled the man long enough for him to be rushed and overpowered, or would he merely have shrugged it off and gone about his gruesome business? My impression of body armor (absent any experience except from movies and TV) is that it prevents lethal injuries but perhaps transmits enough shock to the body to be extremely unpleasant, possibly disabling. My Google searches haven't led me to anything definitive (and, indeed, I feel a bit skeevy about searching for the term "body armor" on the web in the aftermath of the shooting). Can anyone shed some light on this? I ask this after reading William Saletan's contention that crazies can escalate the mass-murder war simply by use of readily available "SWAT gear." *The first reports of the shootings had the man in full body armor. Some people now say this was not true. Please treat this question as a hypothetical about a shooter who was wearing full body armor, including Kevlar vest, etc., as suggested in the Saletan article. Officers and police administrators must be aware of the possibility of blunt trauma injury sustained behind body armor that has stopped a ballistic threat (i.e., not been penetrated). Any officer who has had their body armor impacted by a ballistic threat should receive a medical evaluation as soon as possible. Even though the officer shows no after effects other than soreness or a bruise, the possibility of serious internal injury still exists. A prompt medical evaluation will allow for an assessment of occult serious injury. The crux of my question hinges on whether the "occult serious injury" may include immediate incapacitation from the blunt trauma. Although the text refers to "no after effects other than soreness or a bruise," it should be obvious that trauma resulting in soreness and bruises (such as a punch from someone who knows how to punch) can easily knock a person down, knock the wind out of him, or immediately incapacitate him from pain. For example, this personal account: when I played football in high school, I was once "speared" by a player's helmet during a play. The contact hit me right in the solar plexus, knocking me down and rendering me incapable of doing anything, even drawing a breath, for what seemed like a minute but was probably ten or fifteen seconds. If blunt trauma through body armor could result in the same sort of incapacitation, could not a deranged, body-armored shooter be stopped long enough for him to be overpowered? While nothing is "invulnerable"; Modern body armor is extremely effective. Type I (.22 LR; .380 ACP). This armor protects against .22 long rifle lead round nose (LR LRN) bullets, with nominal masses of 2.6 g (40 gr), impacting at a minimum velocity of 320 m/s (1050 ft/s) or less, and against .380 ACP full metal jacketed round nose (FMJ RN), with nominal masses of 6.2 g (95 gr), impacting at a minimum velocity of 312 m/s (1025 ft/s) or less. Type II-A (9mm; .40 S&W). This armor protects against 9mm full metal jacketed round nose (FMJ RN) bullets, with nominal masses of 8.0 g (124 gr), impacting at a minimum velocity of 332 m/s (1090 ft/s) or less, and .40 S&W caliber full metal jacketed (FMJ) bullets, with nominal masses of 11.7 g (180 gr), impacting at a minimum velocity of 312 m/s (1025 ft/s) or less. It also provides protection against Type I threats. Type II-A body armor is well suited for full-time use by police departments, particularly those seeking protection for their officers from lower velocity 9mm and 40 S&W ammunition. Type II (9mm; .357 Magnum). This armor protects against 9mm full metal jacketed round nose (FMJ RN) bullets, with nominal masses of 8.0 g (124 gr), impacting at a minimum velocity of 358 m/s (1175 ft/s) or less, and .357 Magnum jacketed soft point (JSP) bullets, with nominal masses of 10.2 g (158 gr), impacting at a minimum velocity of 427 m/s (1400 ft/s) or less. It also provides protection against Type I and Type IIA threats. Type III-A (High Velocity 9mm; .44 Magnum). This armor protects against 9mm full metal jacketed round nose (FJM RN) bullets, with nominal masses of 8.0 g (124 gr), impacting at a minimum velocity of 427 m/s (1400 ft/s) or less, and .44 Magnum jacketed hollow point (JHP) bullets, with nominal masses of 15.6 g (240 gr), impacting at a minimum velocity of 427 m/s (1400 ft/s) or less. It also provides protection against most handgun threats, as well as the Type I, II-A, and II threats. Type III (Rifles). This armor protects against 7.62mm full metal jacketed (FMJ) bullets (U.S. military designation M80), with nominal masses of 9.6 g (148 gr), impacting at a minimum velocity of 838 m/s (2750 ft/s) or less. It also provides protection against Type I through III-A threats. Type IV (Armor Piercing Rifle). This armor protects against .30 caliber armor piercing (AP) bullets (U.S. military designation M2 AP), with nominal masses of 10.8 g (166 gr), impacting at a minimum velocity of 869 m/s (2850 ft/s) or less. It also provides at least single-hit protection against the Type I through III threats. Type IV body armor provides the highest level of protection currently available. Because this armor is intended to resist “armor piercing” bullets, it often uses ceramic materials. Such materials are brittle in nature and may provide only single-shot protection, since the ceramic tends to break up when struck. As with Type III armor, Type IV armor is clearly intended only for tactical situations when the threat warrants such protection. Types I, II–A, II, and III–A armor are required to prevent penetration from the impact of six bullets per panel, for two complete samples (front and back panels) at specified velocities and locations for two types of ammunition. Two of the impacts in each six-shot sequence must be at a 30-degree angle. A total of 48 shots are completed on four samples. Furthermore, the deformation of the backing material (a measure of blunt trauma protection) must not exceed 44mm (1.73 in). Deformation readings are taken on each panel at shot location 1, then at either shot location 2 or 3, whichever one had the highest shot velocity. The armor must meet these requirements while wet. Type III armor requirements are identical to those above, except that only one type of ammunition is specified, and all six test rounds are fired perpendicular to the surface of the armor. A total of 12 shots are completed (6 shots per sample). Type IV armor is required to resist penetration from only a single type of ammunition (armor piercing) and is only required to prevent penetration and backface deformation greater than 44mm (1.73 in) from a single perpendicular impact. A total of two samples are tested. The maximum allowable deformation of the clay-backing material was determined through an extensive series of ballistic gelatin measurements and experiments conducted by a team of medical experts. This limit ensures protection from blunt trauma that arises from an impact occurring over vital locations. Even this level of protection, however, does not give an absolute guarantee of protection against internal injuries. Trauma plates are devices that can be added to the vest over a localized area (most commonly the mass center of the torso) to increase the wearer’s protection against blunt trauma injuries. Blunt trauma injuries are caused by the impact forces of the bullet against the armor, resulting in nonpenetrating internal injuries such as bruises, broken ribs, or other injuries to internal organs. Trauma plates can be made of a hard substance such as metal wrapped in rubber or ballistic fabric, or they can be made of additional layers of ballistic fabric, similar to an armor panel. Some manufacturers even build trauma plates into the armor panel itself. 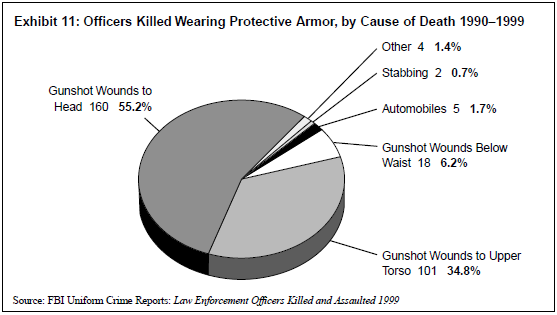 According to the UCR data from the period 1990 to 1999, 290 law enforcement officers were killed while wearing protective armor (see exhibit 11). Of those officers 160 (55.2 percent) were killed by gunshot wounds to the head; 101 (34.8 percent) died as a result of gunshot wounds to the upper torso; 18 (6.2 percent) died as a result of gunshot wounds below the waist; 5 (1.7 percent) were struck by automobiles; 2 (0.7 percent) were stabbed; and 4 (1.4 percent) died by other means. 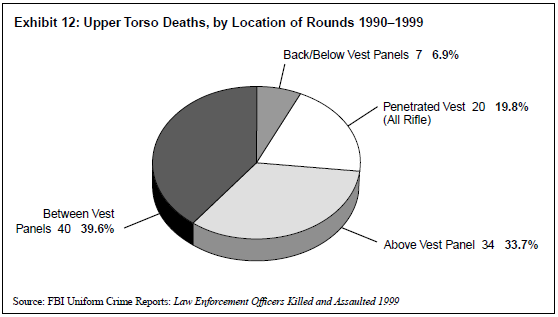 Of the 101 officers killed by gunshot wounds to the upper torso, 40 (39.6 percent) were killed when the round entered the torso region between the panels of the vest or through the arm openings, and 34 (33.7 percent) were killed when the round landed above the coverage area of the vest. Twenty of the 101 officers killed by gunshot wounds to the upper torso died as a result of rounds penetrating the body armor. Of these 20 incidents, all were the reported result of rifle rounds, which the armor was not designed to protect against. It is important to note that no documented fatal injury has ever resulted from a round of ammunition penetrating body armor that NIJ had approved as protection against that level of threat. Source: Selection and Application Guide to Personal Body Armor, U.S. Department of Justice (2001). Short of disrupting the brain or severing the upper spinal column, immediate incapacitation does not occur. Therefore, the threat remains to the officer. Yet, implicit in the media presentations of law enforcement encounters is the belief that with the “proper handgun” and the “proper ammunition,” officers will inflict immediate incapacitation if they shoot offenders anywhere in the torso. Varied and multiple real-life law enforcement experiences contradict this false and dangerous belief. So imagine your disbelief when a threat continues to progress-even after you've delivered what would normally be considered "incapacitating" rounds. You think to yourself, Is it the gun? The ammo? Did I hit or miss? I had to have hit, but he keeps coming. Imagine the thud of realization when you determine your adversary is wearing body armor. Source: Bullet Proof: What do you do when the bad guy seems invincible? The patrol officers were armed with standard Beretta 92F and Beretta 92FS 9mm pistols and Smith & Wesson Model 15 .38 caliber revolvers, Officer James Zaboravan also carried a 12-gauge Ithaca Model 37 pump-action shotgun, but the body armor worn by Phillips and Matasareanu was strong enough to resist penetration. In this case, approximately 650 rounds were fired at two very heavily armored men, who had fired approximately 1,100 rounds. The responding police officers directed their fire at the "center of mass," or torsos, of Matasareanu and Phillips. Each man was shot and penetrated by at least ten bullets, yet both continued to attack officers. Multiple hits only seemed to give these two guys a direction to shoot in. I could find no other evidence that the force of bullet impact(s) would "have disabled the man long enough for him to be rushed and overpowered". An "armed populace" is not going to have much effect on a determined psychopath in modern body armor. Ps. I'm not taking a stance on guns here so please don't start that debate. Not the answer you're looking for? Browse other questions tagged weapons . Can you dum-dum bullets using a knife? Does chain mail protect against arrows?